Started by Ted Knutson in 2013, StatsBomb’s first iteration was a blog that brought together amateur writers with ideas about football statistics and analytics. Over time it built a strong reputation as an online hub for such work and co-existed while Ted worked inside football for the Smartodds group, who owned Brentford FC and Danish club FC Midtjylland. When that position finished, Ted looked around the footballing landscape and saw an opportunity to build a business based on football data and the knowledge he had accrued. Five years on from inception, it’s much more than just a blog. Though the website still runs and produces regular content, the main business has evolved. Based in Bath, the hometown of COO and co-founder Charlotte Randall, StatsBomb recently launched StatsBomb Data–they are collecting data from football matches and creating a cutting-edge, analytically oriented dataset. 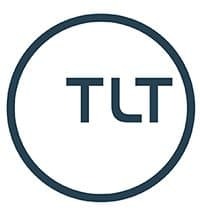 They also have a consultancy arm and their IQ product, an analytical platform that provides a way for customers to incorporate data into their workflow via visualisation and interactivity. The in-house data powers the analysis, closing the loop and making StatsBomb an independent entity that covers the full range from data source to final analysis. That’s a unique strength for the organisation and one which the company thinks differentiates itself from other operators in a competitive field. A worldwide customer base including Champions League clubs and federations certainly agree. 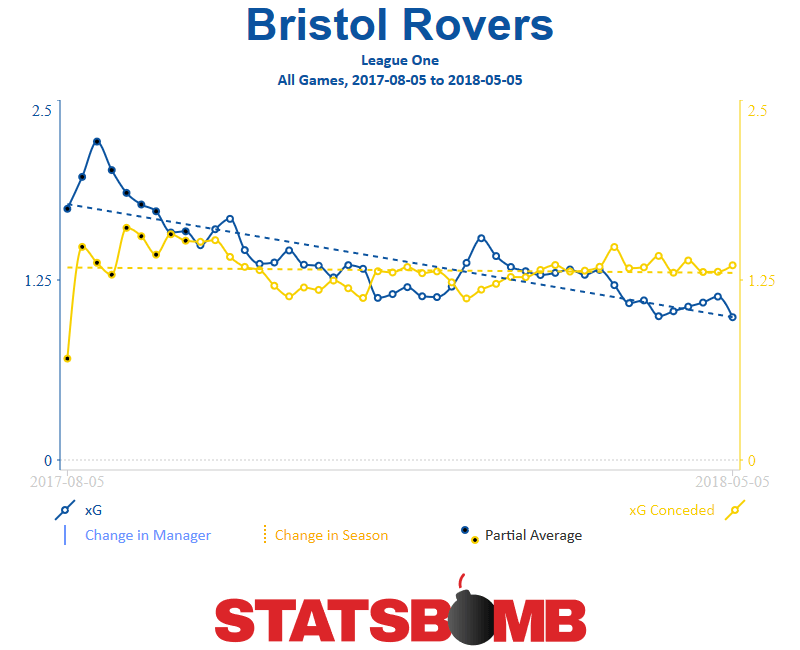 One league that falls under the StatsBomb remit is League One, and having collected data for the full 2017-18 season, StatsBomb is well placed to give an overview of how Bristol Rovers fared last season–from a statistical standpoint–and whether this season will provide any greater joy for fans of the Pirates. Rovers’ 2017-18 season came out close to expectation. We have a model that calculates goal expectation based on the location of shots and a variety of other factors such as goalkeeper and defender positioning or the type of attack, say a corner or set-piece. While some teams can deviate strongly from their expected totals, Rovers did not. In attack, we calculated an expectation of 62 goals and they scored 60, while in defence they were almost bang on with an expectation of 67 compared to 66. One warning for the future would be that their form tailed off at the end of last season significantly. That poor form consisted of two wins in their last 14 games, and is represented clearly when we analyse their performance via expected goals. In particular, their attack waned significantly as the season drew to a close, and they only scored twice on two occasions in that run. This chart shows a ten-game rolling average of expected goals (xG). The attack (blue line) was at its lowest point at season’s end. Defence, in general, was steadier. Overall, Rovers should be able to keep clear of trouble this season if they can just replicate the level of last season. Achieving significantly more than that will be tough. 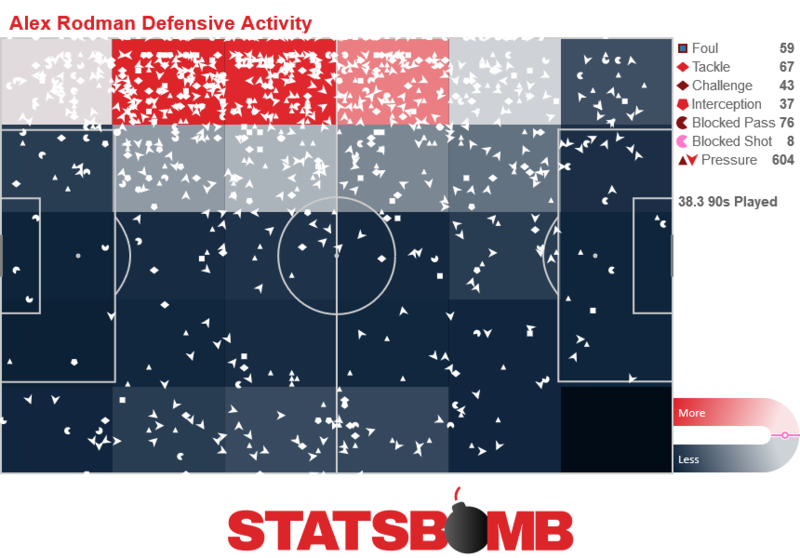 Check out StatsBomb.com for more in-depth football analysis of your favourite teams.